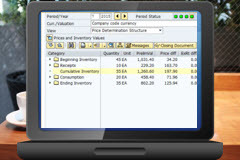 The Material ledger module is useful for actual costing and parallel valuation of inventory. It combines the benefits of stable prices from standard costing with the benefits of actual costs from moving average costing. In this course, you learn how to prepare data and execute the costing run for actual costing purposes and understand how to transfer cost components from a sending company code to a receiving company code, and identify the intercompany profit in inventory. Paul Ovigele is the founder of the online micro-consulting platform, https://www.erpfixers.com/. He has worked as an ERP financials consultant since 1997 in both North America and Europe, specializing in implementing the Financial Accounting and Controlling modules along with their integrated areas for companies in industries such as consumer goods, chemicals, logistics, pharmaceuticals, apparel and entertainment. Paul has delivered numerous training sessions to finance professionals at both the functional and managerial levels, is published in FinancialsExpert where he also serves as a technical adviser, and has presented at various SAP financials conferences around the world. Paul is also the author of the books “100 Things You Should Know About Financial Accounting with SAP (2011)” and “Reconciling COPA to the General Ledger (2013)”. MMC`s training courses are so much fun. I am really enjoying the classes. Thank you!